The statements contained in the website have not been evaluated by the FDA. The products are not intended to diagnose, treat, cure or prevent any disease. If you have doubts consult a physician. Upon reception of the order it will be processed as soon as possible. Orders are generally dispatched within one or two working days after reception of payment. We reserve the right to withhold or refuse an order in case of an incomplete payment, unpaid bills, or credit history. You can choose to cancel an order free of charge, before this order has been dispatched. Please contact us by phone or mail to cancel an order. All products shown on this website can be delivered from stock. No rights can be obtained from any of the products shown on our website. Should we not be able to deliver a product immediately due to circumstances beyond our control, the order will be delayed a maximum of 15 days. If after 15 days there is still a problem delivering one of the products, we will confirm the order by phone. Should you notice an error in the delivery address after ordering please contact us as soon as possible by mail or phone. If you receive the wrong product despite the careful and controlled delivery process, this must be communicated to the company within 4 days upon reception (by phone or e-mail). If internal control confirms the delivery error, then the correct product will be sent upon reception by us of the wrong one. Needless to say the extra costs are borne by us. 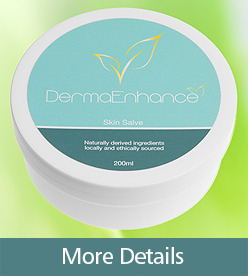 DermaEnhance offers you a 14 working days term during which you can return unopened and undamaged products. Within this period you can return the product at your own expense and accompanied by the invoice. This term starts on the day after reception of the product by or on behalf of the client. We advise you send your order by certified mail and sign up for insurance with the transporter for the commercial value of the products, in case of theft or loss of the products by the transporter. For all return shipments the expenses (including the transport for return) are borne by the client. Only complete products in new product condition and in the original packaging are accepted. Opened, incomplete, damaged or dirty products returned by the client won’t be accepted. If you return a product to DermaEnhace, we will do our best to reimburse you as soon as possible. A return shipment should be sent by mail or another carrier (certified). Before you send us one or more products, please contact us by phone or mail. In case of complaints about the delivered products or services, this complaint must be communicated in writing within 7 days upon reception of the goods. We will try to resolve the complaint as soon as possible in consultation with the complaining party. If no satisfying solution is found for the client, then a dispute or complaint can be made to an independent or judicial authority. On all agreements and possible disputes UK Law applies. Personal data obtained through orders will be used for the correct processing of the order and will not be transferred to third parties under any circumstances. Your personal information can be used for commercial e-mails. In accordance to the law every commercial e-mail will contain the possibility of being easily deleted from the e-mail list.